We left Ladywell early, heading out east via the Greenwich foot tunnel. Which was empty at that time in the morning, before the tourist hour, and on a Saturday no commuter traffic. So we did, I admit, ride through it! Something I haven’t done since about ten or fifteen years ago. When my daughter and I would regularly ride through it very late on Tuesday nights after kayak club in Shadwell Basin, when we were the only people in it. And when the lift attendants had gone home and you had to carry your bikes up the stairs. Out of the tunnel and round the Isle of Dogs, we headed riverside just after Westferry, to view the Thames on this crisp clear Spring morning. Then, away from the river, north and east up on to Burdett Rd to begin what is the tedious part of this ride, whichever way you do it, the slog out of London. There are a few ways to do this. One follows the roads the Dun Run uses to get you up in to Essex. Another nips off that into the forest, heads to High Beach tea hut for a cuppa and then moves on up. The one I’d plumped for goes up Lea Bridge Rd but swings off westwards and up through Chingford and Sewardstone. A route shown to me by a friend. I plumped for this one. It’s not a bad way out of London. No way can you avoid all the bad stuff, jams, pollution, congestion, busy crowded High streets, big roundabouts. It has its share. But so does any route you pick. And at least when I missed the turning on the big roundabout near Chingford, coming off one too early, there is a handy ramped subway to get you back on track easily and safely! 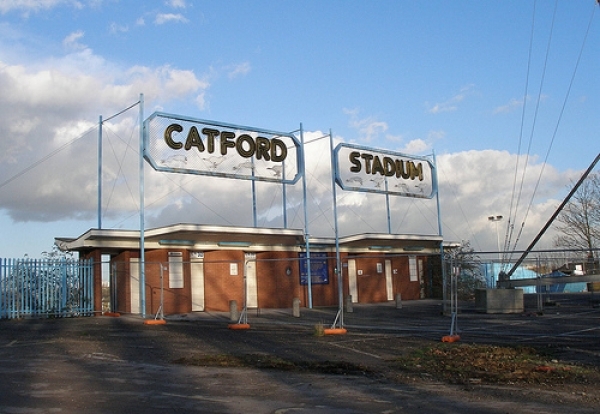 Past Walthamstow dog track, we compared that development to our own Catford one. No dogs bark or run at either now, but at least Walthamstow kept its original entrance and sign, while at Catford, there’s not a hint left of its history. 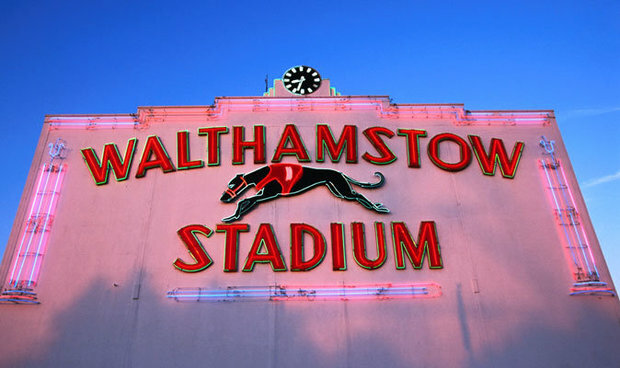 However, Walthamstow’s entrance sign is the more attractive. Art Deco architecture with a greyhound rampant in the red lettering. Bit more tasteful and elegant than our old blue and yellow straight to the point Catford one. Our own dear Catford version. No frills and fancies. Blunt and straight to the point. Now languishing in a dump somewhere. Straight through Chingford Mount, again we took the wrong exit off a roundabout! However, again, no problem, just a quick bit of route adjustment while still riding to get us back on track. One reason I like to use a proper OS map. I often have these alternatives already sorted in my head to use, if I make a mistake en route. It’s easily done, especially on busy roads. And we had an amazing view of the Lea Valley from the top of the hill before descending steeply back to the main A road. Up through Sewardstone and on to Waltham Abbey. The next stretch of road up to Nazeing was probably the least pleasant. Too narrow and winding for the fast and sometimes large motor vehicles using it. Lots of it marked with double solid Centre lines, which motor traffic seems to think doesn’t apply if bikes are on the road. So we held back quite a stream of vehicles, as it just wasn’t safe to allow them to pass, until I found a place we could pull off the road and let them go. We were not sorry to leave this road. We were nearing Roydon now, and from this point I knew the ride gets better and better. Through Roydon, over the train tracks and then we decided to go up the B road through Hunsdon, Wilford and the Hadhams. I had a different route in my head, but this ride became a bit of a team effort en route and the consensus was we might find better pubs this way! Lewisham Cyclists has certain priorities and a ride leader ignores these at their own risk. I took a back seat for a while and dropped behind to chat to the back marker, while others took a turn leading. Very quickly, after the mayhem of north east London’s busy and congested Saturday streets and the impatient rush of the traffic escaping on those narrow roads north, we were riding through quiet villages, stuffed with thatched cottages, wisteria walls, cherry blossom filled front gardens. That’s what the green belt provides. London and its suburbs do end fairly quickly and we don’t have the endless sprawl that goes on for tens of miles that many major world cities do. Through the Hadhams and the Pelhams, little villages linked by similar names and the little roads we were now following. The group were now hungry and thirsty and the pub I had been planning was a little too far ahead for their liking! 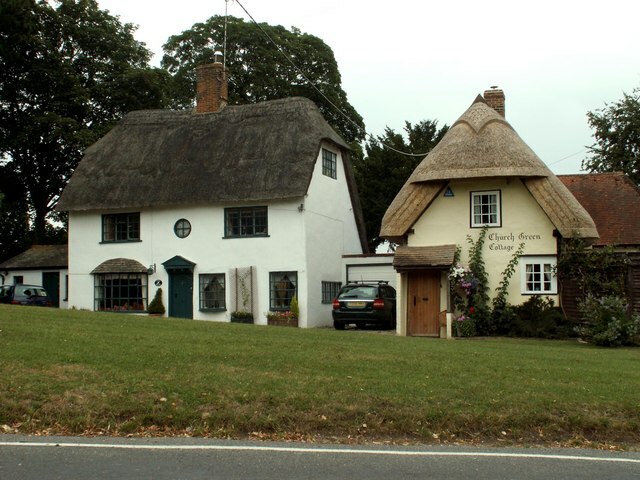 So we headed to Clavering, based on the local knowledge provided by one of our regular riders and leaders, Alex, and the Fox and Hounds. A good choice and one which we’ll use again. Back on our way, again, I took a bit of a back seat and let the lead group take us on. There are several ways you can combine the country lanes that criss cross these county borderlands between Essex, Hertfordshire and Cambridgeshire. They all have the potential to deliver a great ride, being relatively motor traffic free, winding through pretty villages and English countryside. 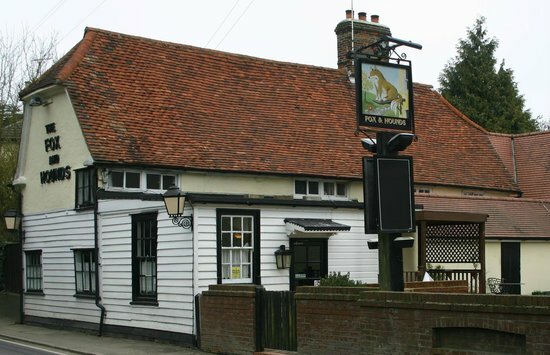 We chose a route which went through Arkesden, about as English a country village as you can get, then Elmdon and finally delivered us to a terrific sweeping descent down to the turn to Duxford. a real wheeeee!!! moment. Here we regrouped and as we set off again on the straight flat road into Duxford, were passed by a neat group of women riders, with whom we had a brief chat as they swept on past. Linton and I decided, a bit cheekily, to hang on their wheels and get a bit of a tow into Duxford. Then, I think he found it a bit of a slow tow, so went on ahead and then the pair of us just had a little sprint into the village. That woke us up after lunch and it was good to see Linton properly back on the bike again! Back together as a group, we headed on through Duxford and were soon riding on busier roads again, nearing Cambridge. 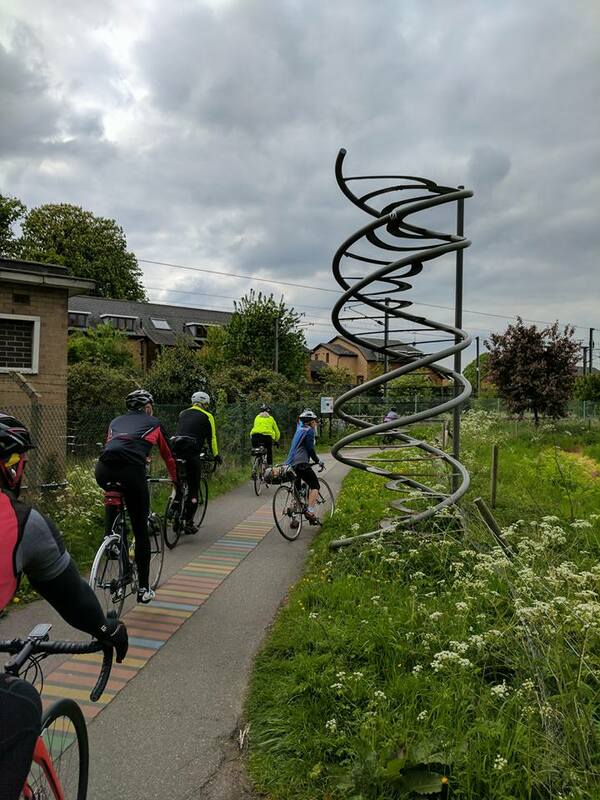 We detoured on to the cycle route to Addenbrookes, Francis Crick Way, with its dual helix sculpture and DNA markings. And then, I was really pleased that we had someone with local knowledge on the ride, because after the hospital there has been so much development here, the new roads weren’t even on my map! 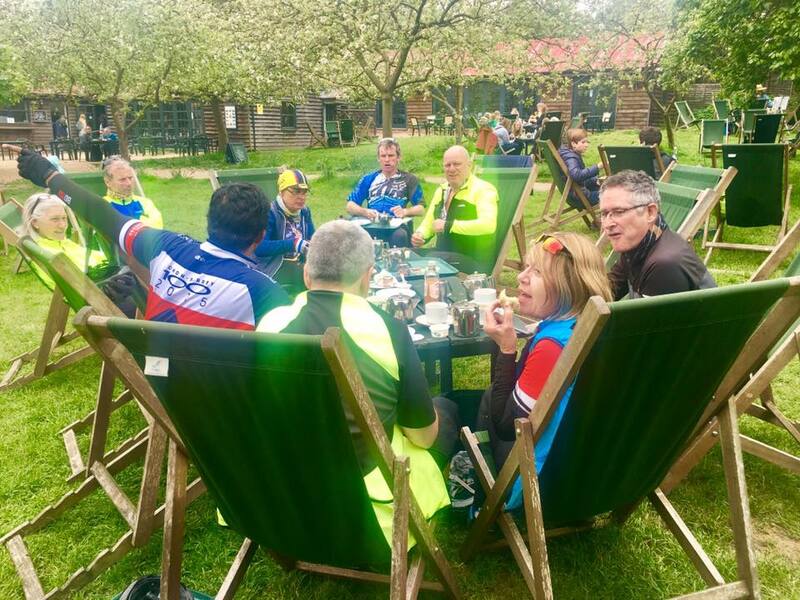 It wasn’t long before we were riding along Grantchester Rd, over the river, past Rupert Brooke’s house and statue and then turning into The Orchard, where we ordered our cream tea, and gathered a collection of tables and deckchairs together under the apple trees. 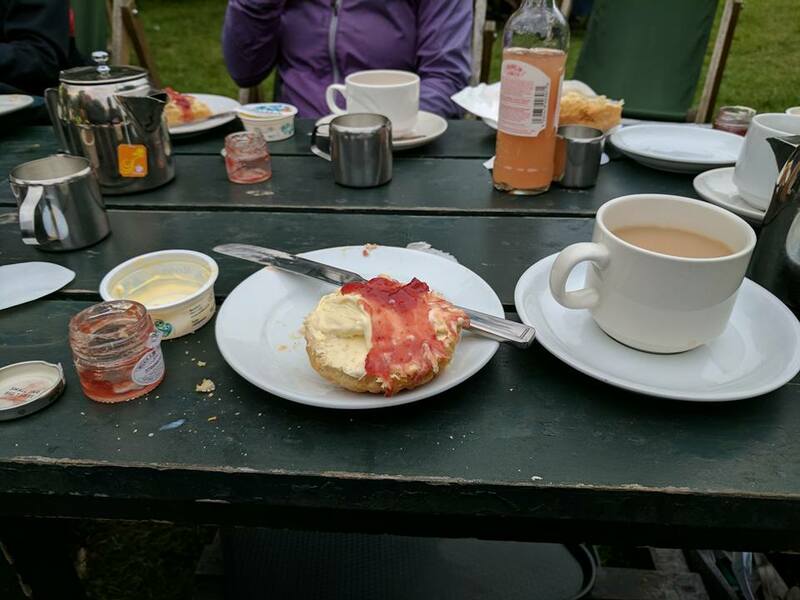 Tea drunk, scones scoffed, we remounted the bikes and headed towards the station. En route, I didn’t notice an especially deep pothole and hit it full on. A load bang, followed by a scraping sound and gradually slowing back wheel confused me for a second. Then I realised my saddle wasn’t actually under my backside any longer and the saddle bag was sliding over the back wheel acting as a kind of rear brake. On closer inspection, it became apparent that the saddle clamp bolt had sheared. Bits of saddle clamp and bolt were all over the road, in fact, and gathered up by fellow riders. Thanks to Linton, for carrying my saddlebag into Cambridge, whilst I rode up on the pedals to the station. Here we said goodbye to Steve, who was heading on for another twenty five miles or so, to Ely. The rest of us managed to cram ourselves on a non stop train back to Kings Cross. It’s a short journey on that train. We pushed our bikes off the train and began to say our goodbyes, all heading our separate ways back home. I pushed my bike to the Evans conveniently situated round the corner, where I got a new seatpost fitted as they didn’t seem to have just the bolt. Trevor kept me company, which was a bit embarrassing as he witnessed the amount of water that fell out of the seat tube! Ooops! One good reason to fit mud guards for winter riding. And a reminder of the serious neglect all my own bikes have suffered this year. It’s already May and I haven’t done one of the Spring services I usually give the three I ride regularly. My bad. Job for this week, hopefully. We then rode back to South East London, passing through Burgess Park, heavily scented with the odour of many barbecues and still busy. Parted in Crofton Park, from where it was just a few turns of the pedals and I was home. A grand day, great weather, good company, lovely ride. And certainly eventful.